Siegmund Wolfsohn (1919-2000) was born in Vienna, Austria, to Elias and Sylvia Greenberg Wolfsohn. He attended public schools in Vienna and was a student at the Vienna University of Technology (Technische Hochschule Wien). In early March 1939, he escaped Austria as part of the Kindertransport to Sweden. From there, he traveled to London in mid-August to visit his mother and sister before immigrating to the United States at the end of August. 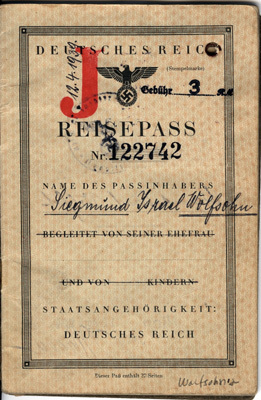 The first page of Siegmund Wolfsohn's German passport. The capital "J" in red indicated that Siegmund was Jewish.